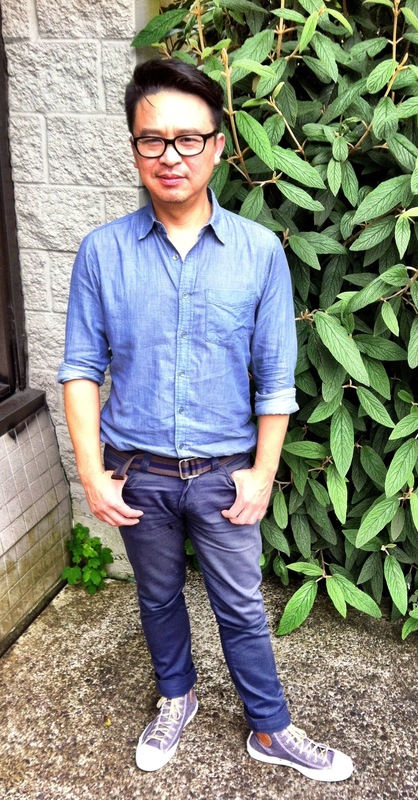 Designer David Chiang is wearing a 100% cotton shirt from his label, National Standards made in Vancouver. David used to design for Ferragamo in Florence, a city we both love and lived in. National Standards menswear can be found at David’s Store, Motherland http://shopmotherland.tumblr.com/ in Vancouver’s Gastown or on Main St. The Motherland stores feature clothing made locally. This entry was posted in Fashion, Stephens Sister's Shopping Diet, Style-Diet Shot and tagged Clothing, David Chiang, gastown, inherited clothes, local, Made in Canada, Main street, menswear, Motherland store, National Standards, second-hand, Stephens Sister's Shopping Diet, sustainably made, Vancouver, Vintage on July 8, 2013 by Gurdeep Stephens.